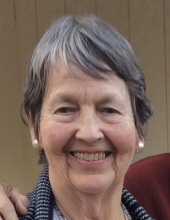 Nancy Robinson Heintzleman, 82, of Harrisonburg, passed away on Thursday, March 28, 2019 at Sunnyside Retirement Community. She was born in Charlotte, NC on June 18, 1936, and was the daughter of the late Gladys Pamelia (DeArmon) Robinson and Samuel Willis Robinson, Sr. In Charlotte, she was happy to be part of a large extended family. Nancy received her Bachelor's Degree from the Women's College at the University of North Carolina at Greensboro, and was a lifelong Tar Heel fan. She was a retired elementary school teacher (teaching 5th and 6th grade) and taught in North Carolina and Virginia. Nancy loved music, knitting, and playing bridge, but her greatest passion was spending time with her family, especially her grandchildren. She was united in marriage to Jack W. Heintzleman on May 30, 1959. They would have celebrated their 60th anniversary this year. Together, they have been lifelong Presbyterians, sharing a deep faith. Surviving in addition to her husband are her three children, Pam Odom and husband Rick, Andy Heintzleman and wife Stephanie, and Karen Riordan and husband John, all of Charlottesville. Eight grandchildren, Drew Odom, Will Odom, Michael Heintzleman and wife Elizabeth, Mark Heintzleman, Matt Riordan, Lindsay Riordan, Caroline Riordan, and Johnny Riordan also survive. A memorial service will be held at 2:00 PM on Sunday, March 31, 2019 at Meredith Chapel of the Sunnyside Retirement Community with Chaplain Will Lowrance officiating. A reception will follow the memorial service. In lieu of flowers, memorial contributions may be made to Sunnyside Retirement Communities, Fellowship Fund, 3935 Sunnyside Dr. Harrisonburg, VA 22801. Online condolences may be left for the family at www.johnsonfs.com. To send flowers or a remembrance gift to the family of Nancy Robinson Heintzleman, please visit our Tribute Store. "Email Address" would like to share the life celebration of Nancy Robinson Heintzleman. Click on the "link" to go to share a favorite memory or leave a condolence message for the family.